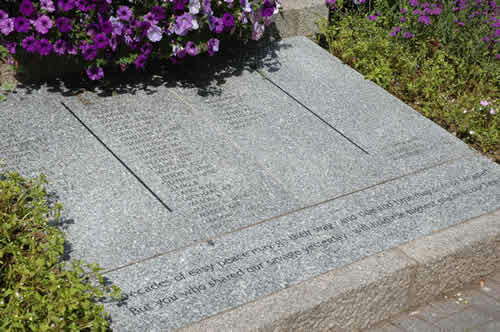 One of the 1939 commemorative slabs on the Exmouth War Memorial. A quotation from a poem by RAF Flight Lieutenant Peter Roberts has been engraved below the names. The full poem is quoted below - it first appeared on the Southsea 1939 Memorial in 1997. That bubbled up more quickly than the rest. And I who held it was doubly blessed. Will hold the highest places in my heart.